Even though I am working on writing about my inexpensive wardrobe right now, I had to break away to share this frugal find. After all, this is still Fun Dollars, so when Fun Spending occurs and there's a story to go with it, it is my duty to report back to you. We are in the full swing of summer now, with the solstice right around the corner. I absolutely love this time of year. It's when the outdoors are the place to be. Gardening, swimming, camping, swimming while camping, taking afternoon walks while the crickets and lightning bugs entertain, and bike riding, just to name a few choice outdoor activities. I am especially excited about summer 2017 for two reasons; this is the first summer I have not stayed at home with both of my children, I have a job now; and this is the first summer that my children have been OUTSIDE during most of the daylight hours. This means that they get to actually enjoy those summer outdoor activities! Before we moved to Illinois, we lived in Arizona. The sun is more intense there. Some people call it "heat". I am quick to correct them. Yes, the heat is hot, and dry, but you can actually feel the sun acting upon your skin when you are outside. With two very fair-skinned children, I had to be careful about when and for how long my kids were outside in AZ. For years, I felt guilty as a mom that my kids couldn't just be outside playing whenever they felt inspired. When we moved from Sedona to Phoenix two years ago, I felt even more guilty. I treated my children like vampires, only letting them out after the sun was down. If we did go anywhere during the day, it had to be somewhere that was air-conditioned. That's life in the summer when temperatures reach 113, you live in an air-conditioned box. All I wanted for my kids was to be able to let them roam free in the summer time. I wanted them to work a garden and eat what they grow. I wanted them to run barefoot through the grass while they chase lightning bugs. Now that we are relocated, they do these things, and so much more! Recently, I was out playing with my children at a neighborhood park, and Lily decided it was time to ride her brother's bike. His wheel diameter made the bike a little too high for her to reach the ground with her feet. This did not deter my fearless daughter. She strapped on her helmet and had me run her through the grass and up onto the basketball court while she peddled furiously. "Peddle, peddle, peddle. Peddle peddle peddle, " I chanted from behind her. I ran with her until she reached a speed that merited me letting go. She rode all the way across the basketball court and into the grass on the other side. She tipped over to get down (like I showed her) and then looked back to see if I was behind her. I wasn't. "You did it! You rode all by yourself!" I called to her. From that moment forward, her summer has been consumed with asking for her very own two-wheeled bike. She started out on a Stider balance bike, which taught her how to propel herself and then cruise with balance. I highly recommend this bike method over training wheels, hands down. 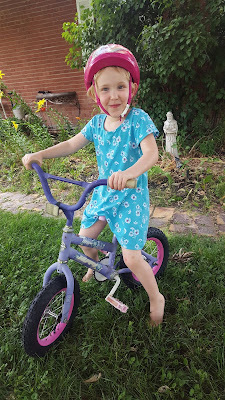 When she was ready for two wheels with pedals a few weeks ago, I knew that her four-year-old legs would quickly outgrow whatever two-wheeled bike we bought for her. My Fun Dollars instincts kicked in, and I was on the hunt for an inexpensive starter bike. I found one on facebook marketplace for $5.00! I had to drive 45 minutes to pick it up in another town, but the price made it worth it. I didn't look too closely at it when I picked it up, however. When I came home and saw that the chain was floppy on the gears and the tires were crackly and didn't hold air, I felt a little disappointed. I should have been more thorough with my questions when I bough the bike beforehand. Well...learn and change for "next time". It was during an oil change at Wal-Mart (no judgement, please) that I took Lily for a stroll through the bike department. I wanted to see if they had what I needed to fix the bike myself. I was certain that with the right youtube video I could pull it off. While I was hunting for 12.5" tires, I was greeted by a kind young man named Todd. Todd described to me the method by which I could change out Lily's cracked tires. Then he added, "Or you could bring it in and I could do it for you." Apparently Mr. Todd was handy at fixing bikes. He told me that if I bought the tires at Wal-Mart, I could bring the bike in and he would give it a once-over. I managed to find two 12.5" tires on clearance for $4.00 each! I did have to buy an inner tube for one wheel at $3.88. So the next day, after getting off work at noon, I went to Wal-Mart with my receipt, tires, tube and bike. I rolled up to the service desk and asked for Todd (as instructed by Todd the day before). He showed up with a smile and took me to the back of the store. I played a game on my phone while he disappeared into the back room with Lily's bike. 20 minutes later (and no charge later) Todd emerged from the stock room with a fully-functioning bike for Lily. The floppy chain had been re-mounted. The tires were fully aired up, and "I straightened the reflector for ya, too," Todd added. $5.00 bike with $8.00 tires and a $3.88 inner tube. Now that's a bike she can grow out of! Happy Summer, everyone, and Happy Spending! If there is one time I count on splurging a little, it's on my coveted sister visits. When I lived in Arizona, I was fortunate enough to get to visit my sister once a year. Sometimes it was by myself, sometimes it was with one or both kids. Whatever the company, or lack thereof, I always enjoyed getting together with the person who has known me the longest in this life, my sister. Last year, I went to help my sister with her new baby while her husband was gone to a conference. As a first time mom, and a working mom at that, she was in need of someone to watch her daughter whom she knew and trusted. I am sure that her mother-in-law would have happily made the six hour drive for the weekend to baby sit her first granddaughter. I knew my mom would not have thought twice about coming up for the three days either. But the person my sister wanted to hang out with and leave her daughter with was me, her sister, who lived 3 day's drive from her; Phoenix to Chicago. Needless to say I flew instead of drove. My husband was gracious enough to grant me my ultimate wish of wishes, to babysit my niece!!! I purchased the plane ticket and arranged for a babysitter for my own (older) children. A few weeks later, I was landing in O'Hare. Since I knew that "Sister Visit" is synonymous with "Shopping" I asked Corey before I left if I could have a Fun Dollars budget for the weekend. I was given $100 to use wisely for any and all purchases. I knew I had to be smart about what I bought, so even though I bought some items for full price, I did so with discernment. I shopped with my existing wardrobe in mind and made a few new additions while staying within my budget. During the time my sister was not at work, she and I drove to our favorite shopping spots; Woodfield Mall, Target, Khol's, Old Navy, DSW, and IKEA (not for clothes...). Just a couple of Sister Shoppers about town. Then during the time she was at work, I warmed bottles and changed diapers, loving every minute of it. Of the items I chose to bring home from my sister visit, this outfit became one of my favorites. I wear the long-sleeved elephant-embroidered t-shirt on a regular basis. It's my signature shirt now. I wear it with the skirt pictured, or with jeans, or with a black skirt, or black dress pants. Sometimes I might even wear it with leggings if I feel daring enough to pull it off. 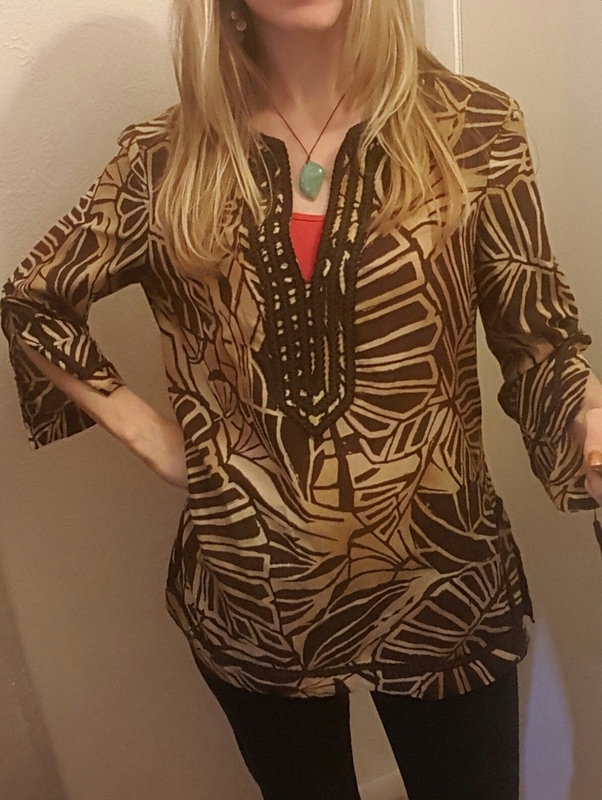 The shirt came from Ragstock, ringing in at $13.00, full price. The skirt I found on clearance at Target for $7.00. I wear it with the elephant shirt, or a white tank top. I also have a black tank top and a grey short-sleeved shirt I can rotate with the skirt. 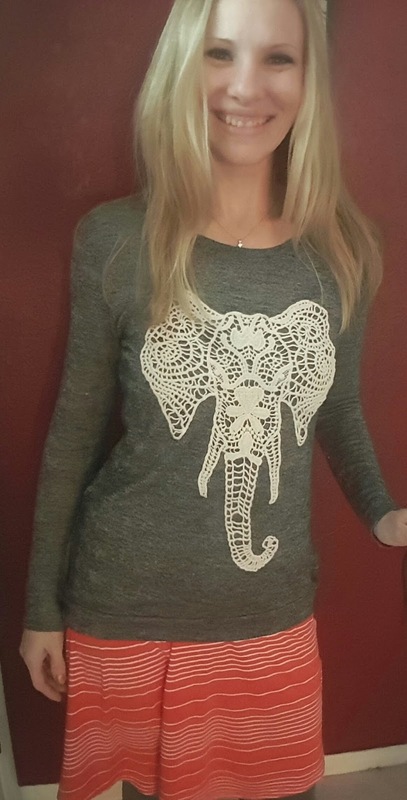 But when I wear the elephant shirt with the skirt, with the grey leggings (cropped out of the picture, and also from Target,) I am wearing an entirely "Sister Visit" outfit. I bought all of those items while shopping with one of my best friends, my sister. This post is in honor of my late grandmother, Helen Elizabeth Robinson. With the news of her passing today, I feel it is only fitting that I share with you her influence on my Fun Dollars spending. For as long as I can remember, at least part of my wardrobe has consisted of second-hand clothes. I used to go shopping with my mother at various consignment shops when I was in grade school. Some of my most memorable outfits as a child came from these stores. At first, I was self-conscious about wearing clothes that other people had worn. I thought that somehow other kids at school would know that my clothes weren't expensive and make fun of me. However, it was my grandmother's pride in bargain-hunting, thrift store shopping and rummage sale purchasing that dissipated my notions of inferiority. My grandmother was never bashful about her bargain buys. To her it was a joy and a triumph that must be shared with all. If someone complimented her on an outfit or a piece of jewelry, her response was never, "Thank you", it was, "I got this at 65% off at Carson's..." and ramble on about the sales person she talked to, what other purchases she made and how much she spent and saved all together. With Helen, it was always about the bottom line, her savings. Her eagerness to share prices didn't stop at compliments, either. It spilled over into her gift giving as well. It didn't matter if she was giving you a birthday present, Christmas present, or a "just because" present, she would always leave the price tag on the gift. 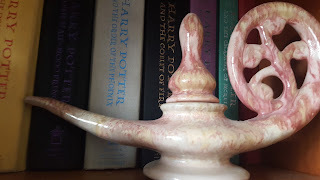 Then, upon opening the gift, there would be some recollection of where she bought it and how much she saved when she purchased it, oftentimes referencing the price tag that remained. Grandma relished a good find when sale shopping and bargain hunting and was never ashamed to admit it. My grandmother was a frugal indulger. She wouldn't think twice about going to a rummage sale and buying an outfit for $1.00. It didn't matter if she had 10 pairs of jeans at home, if she was at a rummage sale or thrift store and found a pair that fit, she would take them home with her. Every time I saw her she wore something different. Her wardrobe seemed like a bottomless pit of clothes, none of which were ever purchased at full price. I remember going to her house once upon a time and she had clothes hanging up on her shower curtain rod in her bathroom, just like they would be hanging up in a closet. At first I thought that maybe she had hung them there to dry. I came to find out she had run out of space in her closet and had nowhere to put them. Her shower rod was simply bonus storage space. And make no mistake, all of those clothes were second-hand or purchased at rock-bottom prices. They were all things she couldn't pass up because they were inexpensive. I learned to take pride in my frugal spending. Maybe not sharing how much I spent with everyone who comments on my finds, but I never hesitate to share where I bought something. I believe in giving credit where credit is due. If someone likes something, sharing a bit of the history is part of the fun of the hunt. And, once in a while, when it's appropriate, I will share the wonderful bargain price or the amazing deal on whatever is complimented. One of the reasons I enjoy shopping at Goodwill is to prove that looking fabulous doesn't have to cost a fortune. I also have no problem wearing inherited clothes from friends. My days of apprehension about wearing second-hand items are long gone. My grandmother would have been so proud; looking this good for only $10.00. In Loving Memory of Helen Elizabeth Robinson. If I could share one piece of advice to newbies starting their closet curation process, it is this: Purchase items that will work with more than one thing you already own. The more versatile your clothes are, the more outfit options you have. You can turn three pieces into six outfits if you know how to shop. Since I am primarily budget-minded when I shop, I don't like to buy things that can only be worn one way. If I buy a shirt, I think back to the bottoms I have that might go with it. If I buy capris, I imagine my closet and the shirts hanging in it that will coordinate. Versatility gives you the option to be ready for any occasion. It allows you to dress for any weather. It gives you more choices when the laundry isn't caught up. And, above all, it saves you money. This week's clothing theme is "Out of Africa". I have chosen my first five outfits to write about, and they all have some sort of nod to Africa. It's not something I particularly chose when shopping for these outfits, but as it happened, I have shown an affinity to bolder prints over the past few years. After going through ALL of my clothes, I noticed I had several groupings of similarly-themed outfits. There is my "Out of Africa" collection, which I will be sharing this week. Next I will show off my "Pretty in Pink" collection. 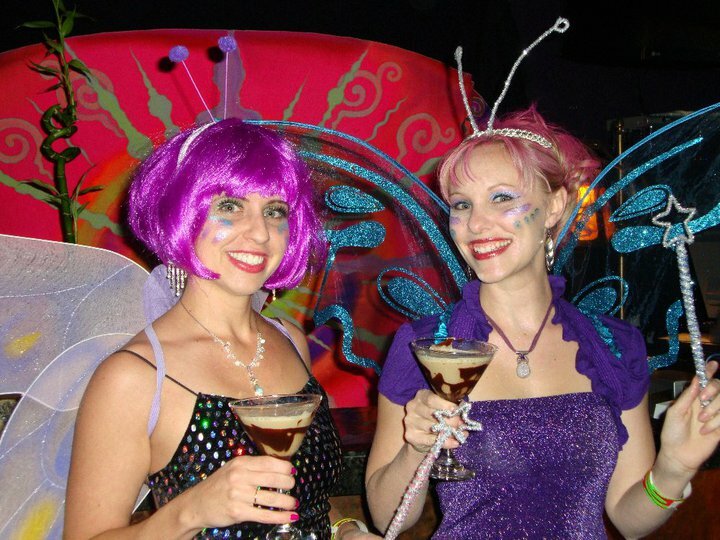 After that, I will move into "Stipes and Solids", finishing off with "Glitz and Glam". After sharing all my work clothes I will do a bonus week of my "Evening Out" clothes. These are like my "honorable mentions". They are clothes with stories, but not necessarily ones I would wear to work. To kick off my "Out of Africa" week, here is my first outfit. It consists of a cheetah print tiered skirt, leggings, and a black camisole. On Monday, when I wore this outfit, the temperature outside was 46. Needless to say, I was not going to waltz outside in a cami and sandals. However, the high was supposed to reach 76 in the afternoon. I knew I didn't want to be sweaty and gross after work while picking up the kids. So, I planned ahead. I wore a black sweater and a puffy vest in the morning with my sheepskin boots. After lunch, I went out to my car for a quick-change. I swapped boots for sandals, and a black cardigan for the sweater and vest. Lighter clothes to feel cooler in my day...planning for the versatility I knew I would need. At the core of my outfit is the cheetah print skirt. I bought this at one of my favorite stores when I lived in Sedona. Allie Ollie was my place to shop. I would meet my best friend there and we would play dress up. Most of the time we would leave with a shopping bag to attest to our store loyalty. The skirt started out one tier longer than what you see pictured. It was originally more versatile than just working for differing temperatures. It was made so that it could be worn as a skirt or a dress! I never did like it as a dress and for about two years, I would roll the waistband/bodice so that it would cover up the top tier and shorten the skirt. I wanted it to look as short as in the pictures I am showing you now. After wearing an incredibly tight waistband for two years, I thought to myself one day, "I will never ever wear this as a dress. Why do I torture myself by making the waist band so tight just to get the length I want? Why not just cut off the bottom layer?" By making the decision to shorten the skirt, I was giving myself the freedom to wear the skirt more often. I didn't like wearing it that much because it was either too long, or too uncomfortable. Now I wear it so much more often because it's the length I want and it's comfortable. I wear it in the summer time with a cami or tank top and no leggings. I wear it in the spring and fall with opaque leggings and a layer over the cami. On cooler days the layer is the black sweater; it's one of my lighter sweaters. On warmer days I layer the sheer, black cardigan. I change my shoes out according to the temperature too (boots or sandals). In the winter time, I wear my black, fleece-lined leggings and a heavier, creme colored sweater. It breaks up the darkness of the black when it's already so dark outside. One skirt I can wear year-round with three different tops. I never put this skirt away for the seasonal shift. It is a permanent fixture in my closet. Its construction and fiber content have allowed it to hold up in shape and color for so many years I have lost count. I think it might be a six or seven-year-old purchase? Fun Dollars very well spent. This skirt is the hallmark of versatility. Even though I can't wear it as a dress anymore, it is still incredibly versatile and works on many levels in my wardrobe. Take a look at what you have in your closet this week. Find the items you own that are the most versatile. Maybe they are items that can be dressed up and dressed down. Maybe they are things you have that can be worn with several other items. See what you have that can serve you in more than one season. Take note of these items. They are the backbone of your closet. Until Next Time....Happy Closet Curating! If there is one thing I take pride in, it's my closet. Over the past several years while blogging about Fun Dollars I have had the opportunity to carefully curate the threads I own. Whether I bought them at Goodwill, inherited them from my sister, took possession at a clothing swap or found them on sale, each item in my closet was given careful consideration before coming home with me. I have had four years of purging clothes that no longer work for me, collecting clothes to fill in the gaps, and "merchandising" my closet on a budget. My motto for closets is this, "Let your closet be your favorite place to shop". Arrange your clothes like you would if it were a boutique. Put items together to create outfits. You can organize by color or by style. I like to use shopping bags to store smaller items like underwear, socks and delicates. Every time I put my hand into a Victoria's Secret bag and pull out a pair of undies, I feel like I am shopping in my own closet. Save bags from stores that look appealing to you and make your closet look like you just took a shopping trip with your best friend. I want to start a new chapter of Fun Dollars with the focus being on my fabulously fun threads. I want to showcase what careful closet curation looks like. Since we are not really utilizing the Fun Dollars system right now, I miss writing about Fun Dollars. I feel like a part of me is missing. I also get the most interest from friends about my Fun Dollars blog. So, to satisfy my need to write about Fun Dollars, and to give people what they want, I proudly present My Thrifty Threads. Now that the weather is starting to warm up, and spring is in full swing, I needed to go through the paces of switching out sleeves for T's. I did all my laundry to see what I actually had in stock. I also unpacked the rest of my boxes from the move just to be sure I had everything. I took a small bag of goods to a clothing swap, and brought home even less (which I consider to be a good thing.) Then I went through everything again to find the gaps in my wardrobe. I also stared a new job last week, and had a new need to look my best. My days no longer consist of yoga pants and hoodies. I get to actually look presentable for other humans, not just hole up at home doing dishes with Lily. With that in mind, I took myself to Goodwill with a very lean budget: $20. Yes, with a mere $20 I was determined to fill in the gaps of my warm-weather wardrobe. Whole most people feel the need to drop $50, $100, or $500 on a new wardrobe each season, I find no satisfaction or thrill in this practice. I like spending as little as possible for maximum impact. I knew I needed some sandals and a non-black cardigan at the very least. Some dress pants wouldn't be bad to have, and possibly a white shirt to wear with my peach-pink linen shorts. (Peach-pink is the color my daughter made up for my shorts. I like it, so I use it.) With three "must-haves" on my list, that didn't leave a lot of extra for glory shopping, so whatever else I chose to bring home had to work on several levels for it to be a "careful curation" of my closet. At Goodwill, there is a fun little trick I have learned. It's called, "Don't shop all at once" and "If you love it, buy it, because it could be gone tomorrow." I carefully weigh these two seemingly opposing mantras every time I enter a Goodwill store with a mission. When Goodwill receives donations, they use different colored tags for pricing. Then each store rotates the color of tag as their Half-Price Tag. Some days it's blue, other days it's yellow or green, but you never know what color it will be when you enter a store. When I shop at Goodwill, I always look for the Half-Price Tags first, keeping my mission in mind. My usual tactic is to load up on anything that suits my fancy with the Half-Price color on it. Chances are more than half of what I pick out to try on will not work. Sometimes the fit looks strange on me. Sometimes I discover a stain or rip that I didn't see when pulling it off the rack and giving it an initial inspection. So, even though I start out with 10 or 20 items in my cart, I might leave the dressing room with only three items that actually work. After my first round of dressing room decisions, I go back and look through the items in a different size. Due to the fact that manufacturers have varying size ranges, it pays to go through another size category. A size 2 at Old Navy is a size 5 at American Eagle. Once again, I look first for the Half-Price Tags, and grab anything else that looks like it might work for my list. After my second round of dressing room decisions, I look at everything I have in my cart that fit, and has no rips or stains. I break things down into two categories: the clothes that are Half-Price, and the clothes that are full-price. Out of the Half Price items, I pull out what I need to check off my list. If I can fill in my wardrobe gaps at a lower cost, I am being smart with my Fun Dollars. Then, based on what is left in the full-price pile, I see what is needed to finish filling in the gaps. When I have as much as I can checked off on my list of what I went in there to buy, I see what is left in my budget. Then I choose from either pile based on that number. Maybe there is a wonderful dress in the full-price pile and a pair of jeans in the Half-Price pile. I weigh what will work best with what I already have V.S. what I will wish I had purchased after I leave. There are times when I have left Goodwill thinking, "Man, I wish I had bought that blouse from Express. It was brand-new with the tags still on." So I think about what my regret might be (if any) and look at what's left in my budget. After all that serious decision making, I go back through once again and see everything I have chosen. Sometimes I don't get everything on my list checked off. That's OK. It gives me a reason to go back on another day. There will be new items donated and tagged. There will be a new Half-Price color sticker, and a whole new shopping adventure to experience! Now, this might sound like a lot of work just to pick out a few clothes. Truthfully, I relish the process. I have my mother's penchant for "hunting" for just the right item, and my grandmother's eye for a bargain. It's in my blood. There is nothing exciting to me about walking through a mall, stopping in at a store and having ten of exactly what I want right in front of me for full price. I love saving money, I love hunting for treasures and I love playing the balance game of "Wants V.S. Needs". It's a part of who I am, which is why I am sharing it with you. So, after two separate trips to Goodwill in the past week, I spent $18.00 of my $20.00 budget. I came back with like-new Jennifer Lopez sandals, a Jones New York blouse, dress pants that fit (not only my waist but also my shorter legs), a chocolate cardigan, a white shirt (for the peach-pink shorts), and some footies to wear with my flats. After going back through my closet and pairing new outfits together, I discovered I have enough clothes for the summer to wear a different outfit everyday to work for and entire month!!!! So, as I go through each outfit, I am going to post a selfie and explain where each item in my outfit came from. It's a way to celebrate and appreciate Fun Dollars I have already spent and to give some creative perspective to anyone with a closet conundrum. It will be part fashion blog, part Fun Dollars, and 100% Fun! Join me on the journey of My Thrifty Threads.